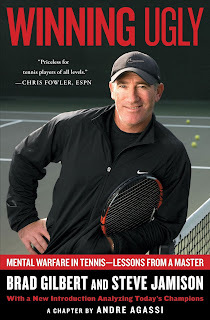 Winning Ugly is the masterpiece book written by Brad Gilbert, a great tennis player and well known as Andre Agassi's coach during his career explosion. Now I'm no tennis player, but the ideas fit really well with table tennis across about 90% of the book. I had the National Team Trial coming up and someone suggested to me that I should read the book as it may help me with my table tennis and sporting mentality. The book itself contains a lot of tennis related ideas and techniques but its main focus is on the mentality and psychological elements of competing in any sport. I read the book twice before my build-up to the National Trial and it made a huge number of differences to my mental game. The player that stepped out to the table on that day was a different player to the one I had been in the past. I think the great thing about Brad's book is that there are such relatable stories from his playing career and he describes the mental way some players approach the game and you can really picture players you compete with in table tennis who are similar. Reading the book really made me reflect on my match mentality in previous years and at that point I knew I needed to start making changes if I wanted to see better results. One of his best metaphors in the book is to play like a boa constrictor. A boa constrictor is a snake which wraps around it's prey and tightens it's hold each time it's prey exhales, eventually the prey suffocates. He uses the constrictor to demonstrate pressure in sports. Apply pressure to your opponents weak areas continuously and eventually they will make enough errors for you to win the match. The real moral is not to squeeze your opponent to death, but to apply just enough pressure so they can no longer do anything. I learnt more about not overplaying shots and I definitely became more tactically aware of what I was doing in matches, I took more time to cement my gameplan and just worked away at hammering my opponents weak areas and locking down their strengths as best I could. This book is a must read for anyone who wants to improve their mental game in any sport. After reading it I was able to achieve good results at my warmup tournaments, the team trial and the national championships. Arguably I had my best run ever and I definitely give credit to 'Winning Ugly' for its part in the process!